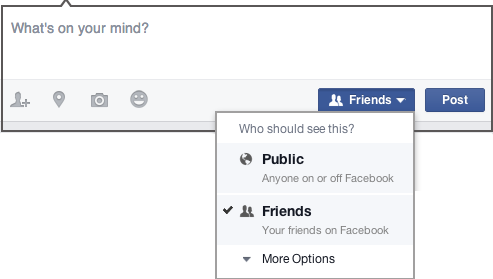 Posting a privacy notice on your Facebook feed does nothing to keep your updates, photos, or videos private. You need to tweak the settings yourself. Your posts control who can see what you share when you post from the top of your News Feed or your profile. This tool remembers the audience you shared with the last time you posted something and uses the same audience when you share again unless you change it. If you need to delete a post go to your Timeline and find the status update, photo, or video you want to remove. Open the menu in the upper right corner of the post and select Delete. Your profile includes information about you like Work and Education, Places You’ve Lived, Family and Relationships, etc. To see how others view your profile, go to your profile and select View As… on the menu in the lower right corner of your cover photo. If there is information that you don't want the world to see, then click Update Info at the bottom of the cover photo of your profile to make sure it's up-to-date and shared with who you want. Your apps are what you've logged into with your Facebook identity. More and more websites and applications, including Avast, are allowing you to do that, because it's more convenient than creating a new username and password. When you choose to use your Facebook information to log in, you are also sharing personal information from your Facebook account with the other website. Third party websites can also sometimes post updates to your wall on your behalf. You can edit who sees each app you use and any future posts the app makes for you, or delete the apps you no longer use. Edit your apps by going to your App Settings. You can view other settings at any time in your Privacy Settings. Or click the padlock icon located in the top right corner.